Need more detail? Contact a respondent directly. Let’s say a respondent wrote something where you aren’t sure what she meant, but would love to know. PickFu offers the ability to ask a follow-up question. This feature enables you to reach out to a respondent directly and ask a question or clarify a particular comment. To do this, simply click on the Ask Follow-up? link below the response. 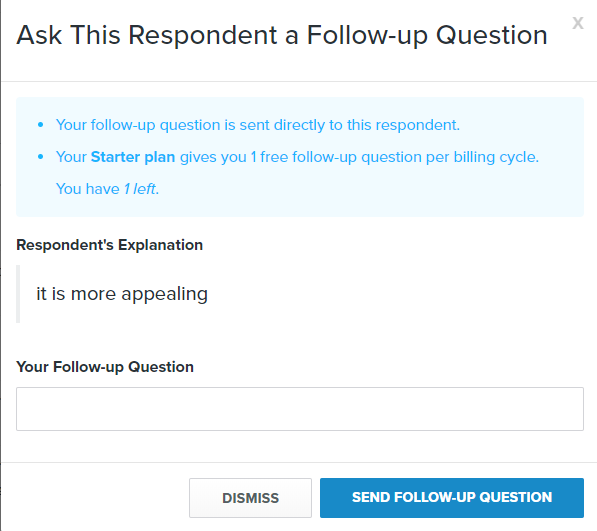 Ask your follow-up question, then click the Send Follow-Up Question button. You need a Starter plan or higher membership plan and pre-paid credits to ask a follow-up. 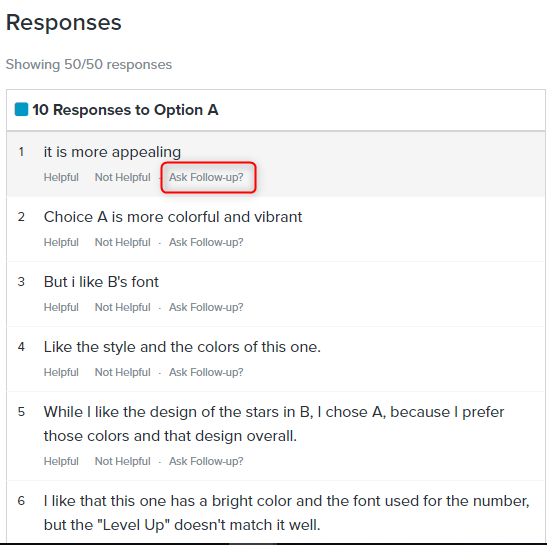 We've included some follow-up questions in each plan tier for you to use the feature at no additional cost. After you've exhausted the questions included in your plan, each follow-up question costs the same as your per-response cost for the poll. For example, if you pay $.90 per response, your follow-up will also be $0.90. If the respondent doesn't respond within 2 days, your account will be credited the cost in pre-paid credit.